Viewing topic "configure new arpeggios in S70XS NoAsg User arps"
It’s not possible to tell from your attached screen capture whether the S70XS already has some User Arps loaded, because the Editor is OFF LINE. When placed ON LINE and synchronized S70XS>PC, the Editor can display any User Arps that are in the S70XS. Arps are categorized into Main and Sub categories. See Arpeggio Category and Sub Category on pages 7-8 of the S70XS Reference Manual (http://download.yamaha.com/file/9610). If the creator of an Arp didn’t place it in one of the Categories, the Arp will default to NoAsg (No Assignment). The S70XS can load various file types, as shown on page 127 of the Reference Manual. If such a file includes User Arps, they will be loaded and can be displayed by the Editor when it is ON LINE. 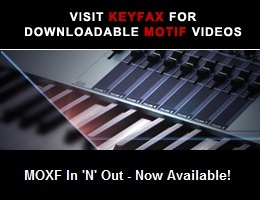 Note that several Motif XS file types, which may include Arps, can be loaded. Before doing anything else, I suggest that you start by getting the Editor ON LINE and look for User Arps that might already be loaded to the S70XS. They can be easily located if you click on Bank (instead of Category) at the top of the ARP LIBRARY window, then expand the User bank. If you find none, you could load some from the file types shown in the Reference Manual. ...and if you can run my Arps-Plus program and save XS (.X0A) Arp files, they can be loaded to the S70XS. Be sure to save your own data from the S70XS before loading any other Arps, in case there are Arps related to Voices already loaded.